Detlef Roth as Amfortas in Stefan Herheim's production of Parsifal at the Bayreuth Festival. How would you describe Amfortas from a musical point of view? Harmonically, the role is very interesting, and it is really important to sing the notes absolutely right on pitch to show the pain of this twisted character. The music is characterized by diminished chords and intervals. I try to sing Amfortas with as many colours as possible to express, for instance, the desperation and the anger. I also want to show the span between piano and forte. Amfortas' suffering is not only extrovert – it is also introvert. Therefore, the silent moments are important for me. I have a wonderful collaboration with the conductor, Daniele Gatti. We understand each other. In Act 3, particularly, we create intimate moments, and this is important for my interpretation of the role. "Mir wurde das plötzlich schrecklich klar: es ist mein Tristan des dritten Aktes mit einer undenklichen Steigerung." How do you understand this statement Wagner makes in one of his letters about the suffering Amfortas? For me, the “undenklichen Steigerung” mentioned by Wagner in reference to Amfortas is - leaving all other musical aspects aside - the yearning for death that cannot be achieved by Amfortas. You mentioned the diminished chords and intervals in Amfortas’ music, obviously an expression of his indescribable anguish and pain. What is this pain all about, basically, and how do you work with this kind of expression? As I have already tried to describe, singing the notes on the exact pitch (for example, the many ‘tritonus-steps’), understanding the harmony in the orchestra and ‘complementing’ it, is essential for me to carry any expressions out. Amfortas’ pain is of course about his wound that will not heal – a physical pain, but, even more so, a psychological pain of many facets caused by his failures. Imagine, a priest who used to take part and initiate the ‘communion’ (“Nehmet hin meinen Leib, nehmet hin mein Blut”) with a clear conscience who all of a sudden fails and will never be able to do so again – one of his many psychological burdens. 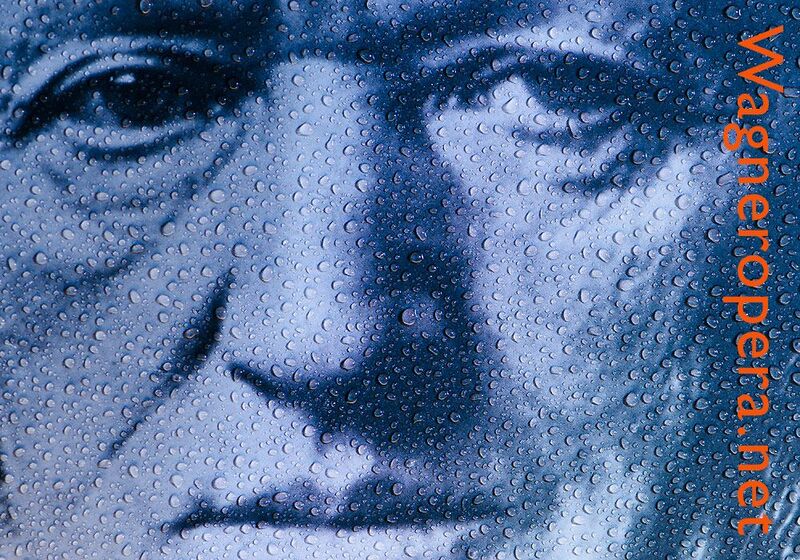 It is very complex to express these and this is why I think Wagner has interwoven Amfortas’ part with the orchestra so much – Tiefenpsychologie. Did Stefan Herheim discuss the singing with you? No, not so much with me. Daniele Gatti did, though. He had a very clear idea about how the role should be sung. He wanted even more piano than we used in the performances. Gatti saw Amfortas as a very, very weak person, as a person immersed in his suffering, only coming out occasionally to be king. Gatti wanted more of almost whispering, but we had to change a lot of that in the actual performances. For me, working on the singing was not so much technical work on the voice, but rather developing the interpretation, especially the colours. It was important for Gatti to have the right colours, and as many colours as possible. Detlef Roth as Amfortas in the German Bundestag in Bonn. Behind him Parsifal enters with the holy spear. Rollover image: Detlef Roth outside the Festspielhaus in Bayreuth. Is Amfortas a difficult role technically? If I had chosen to sing it louder, it actually would have been easier. The piano and all the colours I try to convey makes it more difficult. But this is important for me because it is necessary to show Amfortas' development and suffering. The technical challenge for me is to take the risk and sing the piani. This is possible here at Bayreuth because of the fantastic acoustics. What do you find interesting about Amfortas? In every role I sing, actually, what interests me is the human aspects of the character, whether I sing Papageno or Amfortas. And the more split the character is, the more interesting it gets. Can you identify with Amfortas? Oh yes, of course. His suffering is physical and mental, and that I find extremely interesting. There is a lot of suffering in the world today. I think it is important for any actor or singer to be open and get as much input as possible and channel it into his or her art. Everybody has a personal history with suffering and some kind of experience with death. I don't share Amfortas' longing for death personally, but many people have a dark side and feel – for different reasons – close to death. I try to approach these feelings and understand them. Who is Amfortas in Stefan Herheim's production? Isn't he a little bit on the outside of the "German History Project"? No, I wouldn't say that. As I see it, Amfortas is the conscience of Germany. In this respect he is at a distance to everything, and doesn’t take part in the action. Amfortas wants the dark side of German history to end. His suffering is Germany's. Detlef Roth as Amfortas in Stefan Herheim's production of Parsifal at the Bayreuth Festival. Behind Detlef Roth: Friedemann Röhlig (2. Gralsritter), Arnold Bezuyen (1. Gralsritter), Kwangchul Youn (Gurnemanz). How did you react to Daniele Gatti's slow tempi? There were never any disagreements about the tempi, but it was difficult because it stretched us singers to the limit. I like testing my limits. Were the tempi a topic of discussion during the rehearsals? Yes, of course. Tempi are always discussed during rehearsals, not only in this case. There is a limit for the singers when they can't sing it well, for instance some of the long phrases. But there has been a development regarding the tempi. 2009 was faster than 2008, and 2010 is even faster. I have felt very comfortable singing under Gatti. Mihoko Fujimura as Kundry surrounded by desperate, wounded soldiers in Act 2 of Stefan Herheim's Parsifal production at the Bayreuth Festival. Rollover image: Christopher Ventris as Parsifal surrounded by "Blumen" - seductive women nursing soldiers. Herheim's Parsifal production is very complex and a lot is happening on stage. Is this stressful? Is it difficult to remember everything? Stefan Herheim is very meticulous during rehearsals and details are important for him. But at Bayreuth the rehearsal period is long and we get a chance to fully rehearse all the details. The media attention in the first year, of course, created a lot of stress, but usually when I get out on the stage, I am very comfortable. I am seldom nervous before or during performances. If I have studied my part well, and I am confident that I will do my best, I’m not nervous. I am actually more nervous when we start the first rehearsals, especially when I don't know the conductor or the other singers. When I stand on the stage, I feel comfortable because I know that we have worked hard. I also see it as a gift to be able to give the audience pleasure or whatever. I always do my best, and if that isn’t good enough for some people, then there's not much I can do. And now when we are doing this production for the third year, Daniele Gatti's Amfortas, Stefan Herheim's Amfortas and, of course, my own Amfortas is now a big part of myself. Basically, I now remember everything because I have it in my body. Did you have any opportunity to influence your character in this production? Does Herheim leave room for implementing singers' ideas – or improvisations? Herheim plans a lot, and knows what he wants. He is very precise about that. However, I have never felt that I have to bend over backwards and do something I couldn't do. In this production it is so much going on, and Herheim had a very decisive idea of what each character should do. I felt very comfortable and was open for everything. Had you ever sung Amfortas before Bayreuth? No, not on an opera stage. I did sing in the concert performance in Rome in January 2008. This was a way of getting to know the piece for everybody. Amfortas is a role that has been with me for a long time, though, but it was my role debut when I sang it here in 2008. I have always loved the role and all the aspects of it, and I had studied well before I was given the chance to sing it here. Also, when I was young, I sang the first scene of Amfortas in a competition, so for different reasons the role has been in the back of my brain for a long time. You sing a lot of religious works. Are you religious? Yes, I am a Christian and believe in God, but I am not doing missionary work. Even if I am happy to sing something I believe in, I sing them as a singer. And I sing works like Bach's B-minor Mass, etc., because it is great, beautiful music. Is it important for you to combine opera and concert music? Yes, this is important because it keeps my voice in good shape. They also complement each other technically as well as intrepretively. I never wanted to be put in a box as a "Wagner baritone" or a "Mozart baritone". It is important for me to do a variety of music. Your Wagner roles currently include Wolfram (Tannhäuser), Kothner (Meistersinger), Amfortas (Parsifal), Heerrufer (Lohengrin), Donner (Rheingold) and Gunther (Götterdämmerung). What are your future Wagner plans? No new roles are scheduled, but I would very much like to sing Beckmesser. I find this character extremely interesting. He is not one-dimensional at all, but has many layers. And Meistersinger is my favourite Wagner opera. One of the greatest Beckmessers, in my opinion, is Hermann Prey, and I would love to follow in his footsteps and sing Beckmesser beautifully, as I think this role should be sung. Of course, Beckmesser is frustrated, but he should be taken seriously. I am learning the role now, and I hope to get a chance to sing it. Kurwenal is also something that would suit my voice, but I don’t see myself as a Wotan, at least not in the near future. And, finally, the question everyone is asked: What is it like to sing at the Bayreuth Festival? Well, just walking through the canteen here and seeing so many colleagues I admire is, of course, very special. The rehearsals here are intense, but we have a lot of time, more time than we normally get. The conductor is present during the rehearsals, and in my opinion the director needs the help of the conductor, for example, regarding what works with the acoustics. The team work you see here you normally don't find elsewhere. I talked with some colleagues about the challenges the acoustics presents, but you really have to find out about it yourself and trust the assistants sitting in the auditorium. It is very special performing at Bayreuth, with the history, the productions and the singers. In a way, you could perhaps say that Bayreuth is a temple. The history is always present, in a way, but I try not to think about it too much, especially when I am on stage – then, of course, I am totally focussed on my singing and what I have to do. I'm a big Wagner fan, and I’ve read a lot of Wagner's writings and letters about the idea of this festival, and I especially like the idea that the participants could be like a big family and spend part of their holiday here with the aim of doing the best for Wagner's music. This place is really magical, and I prefer not doing anything between performances. I live in the countryside some 30 kilometres outside Bayreuth. I love to be in the beautiful nature and take walks in the forest. The summers here in Bayreuth are wonderful; it’s something between holiday and work. 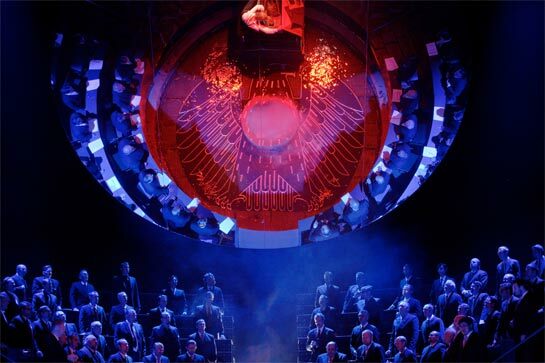 The mirror at the end of Stefan Herheim's Parsifal production on its way down. 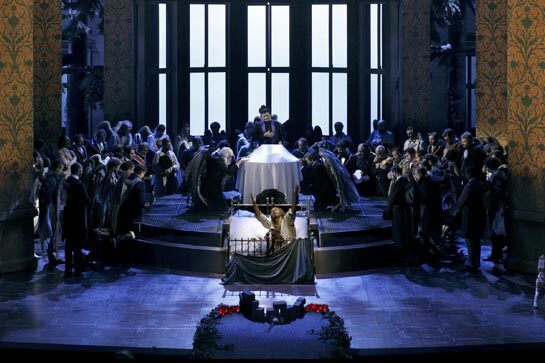 Detlef Roth as Amfortas is reflected at the top of the image, lingering over Titurel's coffin. Detlef Roth was born in Freudenstadt/ Germany and studied voice with Georg Jelden at the Musikhochschule Stuttgart. Winner of the 1992 Belvedere Competition in Vienna and the 1994 "Concours pour Voix Wagneriennes" in Strasbourg, he quickly established himself as one of the foremost German baritones of his generation both as recital and concert artist, and on the international opera stages. In 2008 he made an acclaimed debut at the Bayreuth Festival in the role of Amfortas in the new production of PARSIFAL, conducted by Daniele Gatti, returning to the 2009 Festival for the re-run, again under the baton of Daniele Gatti. He is a regular guest at the Grand Théâtre de Genève where he sang Donner in RHEINGOLD, Gunther in GOETTERDAEMMERUNG under Armin Jordan, Heerrufer in LOHENGRIN, Don Estoban in Zemlinsky's DER ZWERG and Yeletski in PIQUE DAME as well as Amfortas in PARSIFAL. His numerous guest performances over the last five years, have included the roles of Zar in ZAR UND ZIMMERMANN in Hamburg, Wolfram in Bern, Hans Heiling in Strasbourg, Minister in Beethoven's LEONORE in Bologna and Heerrufer in LOHENGRIN in Madrid. It was also as Heerrufer that he made his debut at La Scala di Milano in 2007, followed by Pentheus in DIE BASSARIDEN in Amsterdam. At the request of Armin Jordan he was invited to sing Spielmann in Humperdinck's DIE KÖNIGSKINDER at the Festival de Radio France Montpellier. After singing Donner in DAS RHEINGOLD in Washington D.C., he was invited to sing this role under Simon Rattle in Berlin, as well as at the Aix-en-Provence Festival and the Salzburg Easter Festival. In 2007 he was invited to sing Conte in LE NOZZE DI FIGARO at the New National Opera in Tokyo, and Lysiart in Weber's EURYANTHE in Brussels. 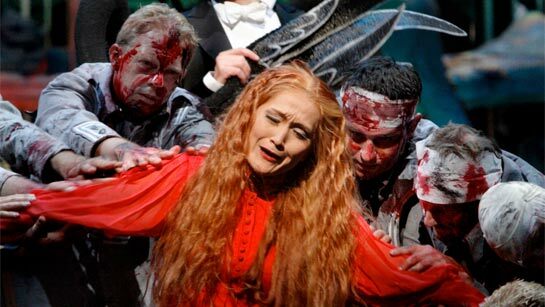 Another interesting debut came with the title role of the Vampyr by Marschner in Bologna in 2008. Since his debut in 1993 at the Opéra Comique as Mr Fluth in DIE LUSTIGEN WEIBER VON WINDSOR, he was invited to sing Escamillo under Kent Nagano in Lyon and Papageno in Paris at the Opéra National Bastille. The Francfort Opera invited him to sing Papageno, Marcello, Eugen Onegin and Dulcamara. Other important engagements included performances at the Salzburg Festival under Lorin Maazel and Valery Gergiev as Masetto. In 2001 he performed Creonte in Haydn's L'ANIMA DEL FILOSOFO at the Schwetzingen Festival and Wolfram in Rome, conducted by Myung-Whun Chung, a role which he also interpreted in Hamburg and Berlin. In concert, Detlef Roth has appeared with many of the world's leading orchestras, notably Santa Cecilia in Rome, RAI Torino, New York Philharmonic, Boston Symphony, Montreal Symphony, Leipzig Gewandhaus, DSO Berlin, Bamberg Symphoniker, Zurich Tonhalle, to name some. He sang Mendelssohn's Elijah under Gönnenwein in Ludwigsburg, with Herreweghe in Salzburg, and with Wolfgang Sawallisch in Tel Aviv; Schumann's Faust-Szenen in Bad Urach, as well as with Jeffrey Tate in Rome, with Sawallisch in Munich and Mahler Lieder with Kurt Masur at the Lucerne Festival. Detlef Roth is also much in demand for Bach's passions, masses and oratorios. He has worked with conductors such as Riccardo Chailly, Daniele Gatti, Valery Gergiev, Wolfgang Gönnenwein, Marek Janowski, Kurt Masur, Armin Jordan, Kent Nagano, Simon Rattle, Wolfgang Sawallisch, Giuseppe Sinopoli, Christian Thielemann, Pinchas Steinberg, David Zinman and Jeffrey Tate. Detlef Roth's discography includes: Mahler's Symphony No. 8 with the Deutsche Symphony Orchestra Berlin under Kent Nagano (harmonia mundi), Beethoven's 9th Symphony with the Tonhalle Orchester Zürich conducted by David Zinmann (Arte Nova) the Weihnachtsoratorium and a prize-winning CD of little-known Schubert Lieder with pianist Ulrich Eisenlohr (Naxos). In addition one can hear him on DVD in Orff's Carmina Burana and Mozart's Zauberflöte.